Last months card swap with my sister had to use stamps out of the Mini catalog. With so many lovely stamp sets it was hard to chose which ones to use. 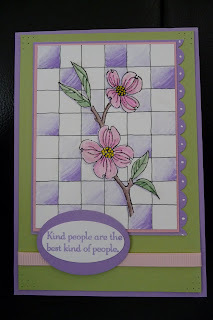 I used soft summer for my cards. This pretty set is a two step stampin set. To make the grit I first drew the grid in very light pencil with my ruler, then stamped my image. I then used a fine black pen to draw in the grid lines around the image free hand. Then colour! Very easy and very effective. I really enjoyed using the In Colours for this card. It's great to see how one stamp can be rotated to make this pretty design.